The Global Festival of Action for Sustainable Development is an annual event bringing together the global community to drive forward the UN Sustainable Development Goals (SDGs) and “showcase the latest innovations, tools and approaches to SDG implementation”. This year EASST was delighted to participate in a plenary session organised by the Child Health Initiative, and chaired by the FIA Foundation’s Avi Silverman, calling for every child’s right to a safe and healthy journey to school. Every day 3000 children and adolescents are killed or injured on the road – many on their way to or from school – while many more are exposed to excessive levels of air pollution, the so-called “silent killer” and another major cause of chronic health problems. This prevents the fundamental right of children to healthy development and an education. 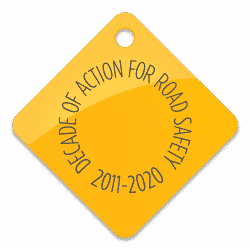 Safe and healthy streets should therefore be, in the words of Bright Oywaya of the Association for Safe International Road Travel – Kenya, who closed the session, “at the heart of sustainable development”. EASST was represented on the panel by Tatiana Mihailova of the Automobile Club of Moldova (ACM). Tatiana offered her support for the app and talked about it’s applicability in the EASST region where many schools – especially in rural areas – lack the infrastructure to keep children safe. She also highlighted EASST’s Safe to School: Safe to Home projects which are bringing together local stakeholders, teachers, parents and road police across the region to improve speed enforcement around schools. Tatiana argued that national level support and a commitment from all governments to ensuring the success of the SDGs in the only way in which progress will be achieved, citing the case of Moldova where the ACM has worked successfully with the Government to ensure road safety and the SDGs are high on the Agenda. Also on the panel, was EASST Trustee Dr. Margie Peden of the George Institute for Global Health and Prarthana Borah, India Director of Clean Air Asia. Margie called for a joining up of inter-sectorial initiatives to reduce road deaths and injuries and a special drive to target the group most at risk – adolescents & young people – as well as a greater focus on post-crash care. The main message taken away from the session was that ensuring child health and mobility is the underpinning of sustainable development. Yet, road safety and sustainable mobility is too often overlooked in the sustainable development agenda. Frequently cited as a problem of the individual rather than as a problem that can be fixed through coordinated effort and strategic initiatives. But there are solutions, we know what they are, and implementing them is critical to achieving the UN Sustainable Development Goals by 2030.